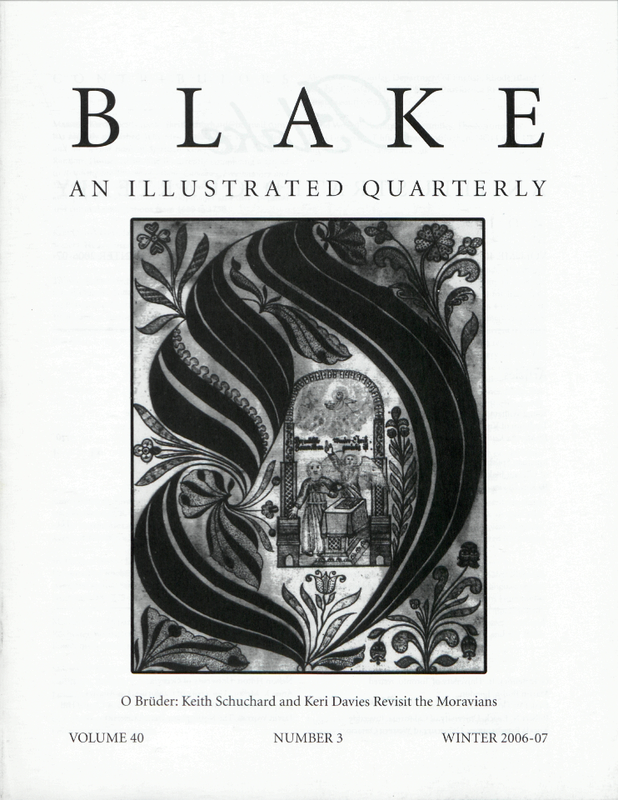 Marsha Keith Schuchard (keithschuchard@hotmail.com) has recently published Why Mrs. Blake Cried: William Blake and the Sexual Basis of Spiritual Vision (London: Century-Random House, 2006). She is currently completing a sequel to Restoring the Temple of Vision: Cabalistic Freemasonry and Stuart Culture (Leiden: Brill, 2002), which will cover British and international Masonic developments and their political and cultural ramifications from 1689 to 1750. Keri Davies (keri.davies@ntu.ac.uk) is secretary of the Blake Society. He is currently research fellow in the Department of English, Nottingham Trent University. Thomas R. Frosch (tfrosch@nyc.rr.com) is professor of English at Queens College (CUNY) and is the author of a book on Blake, The Awakening of Albion (Cornell University Press, 1974) and a forthcoming book, Shelley and the Romantic Imagination: A Psychological Study (University of Delaware Press). Cover: Der Christen ABC (1750), letter O (detail). Ephrata Cloister, Pennsylvania Historical and Museum Commission.